AlaNotice notifications are provided for convenience purposes only. I understand that the only official court records are those maintained in the court's file. I assume all responsibility for checking the offical court records and agree to hold Alacourt.com and the Administrative Office of Courts harmless from any claims resulting from the use of this service. Please check here if you understand and agree to these terms. 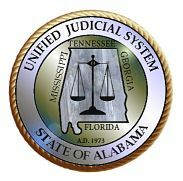 We will verify the above information against the State of Alabama's Attorney database. If the information is correct you will be directed to our Attorney Setup Page. You must enter the information for your own code ONLY. We allow ONLY one notification email address for each Attorney Code. WARNING: ACCESS, OR ATTEMPTED ACCESS, TO DATA IN THIS COMPUTER WITHOUT PROPER AUTHORIZATION MAY BE A VIOLATION OF THE ALABAMA COMPUTER CRIME LAW.